"Recommended Monthly Page Volume" is a range of pages that helps customers evaluate the Lexmark X464de product offerings based on the average number of pages customers plan to print on the device each month. Lexmark recommends that the number of pages per month be within the stated range for optimum device performance, based on factors including: supplies replacement intervals, paper loading intervals, speed, and typical customer usage. 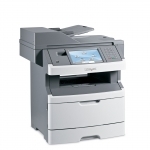 Lexmark X464de Supplies Yield *Average standard page yield value declared in accordance with ISO/IEC 19752. Photoconductor Notes Actual Yield may vary based on other factors such as device speed, paper size and feed orientation, toner coverage, tray source, percentage of black-only printing and average print job complexity. Size (in. - H x W x D) 20.9 x 19.2 x 17.2 in. Packaged Size (in. - H x W x D) 24.61 x 23.62 x 20.08 in. Packaged Weight (lb.) 57 lb. Size, Trays Extended (in. - H x W x D) 21.5 x 19.2 x 17.2 in.